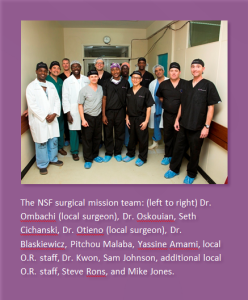 The NuVasive Spine Foundation™ (NSF) completed its first direct mission trip of the year to Kenyatta National Hospital (KNH) in Nairobi, Kenya. The mission trip focused on surgeon training and deformity correction, completing 11 life-changing surgeries. These surgeries were made possible by an extraordinary surgeon team that included: Dr. Donald Blaskiewicz, Dr. Anthony Kwon, Dr. Rod Oskouian, Sound Surgical Spine Specialist Seth Cichanski, Compass Spine Specialist Steve Rons, InoSpine Senior Spine Specialist Mike Jones, IMI Neurophysiologist Yassine Amami, and IMI Director of Operations Sam Johnson. To further develop a sustainable spine program at KNH, the U.S. surgical team also led a multi-course training for local surgeons and nurses. Surgeon training ensures that quality spine care continues to advance in communities around the globe. The NSF is proud to increase our efforts through programs like these. Thank you to those who participated in the mission trip and to all who continue to give generously to support these efforts.